Monday through Saturday: 1:00 p.m. to 8:00 p.m. | Sunday: 1:00 p.m. to 7:00 p.m.
After a successful career as a stylist for iconic names like Prada and Valentino, fashion designer Brookelynn Starnes finally took the jump and opened up her own clothing boutique Cloak & Dagger in 2006. Since the early age of eight, Starnes knew she was destined for a future in fashion. As a girl, she would sketch elaborate wardrobes for her paper dolls. Clarissa Darling, a teen character with idiosyncratic fashion sense from the popular ‘90s television show "Clarissa Explains It All," was her muse. Starnes would watch the show and re-outfit Clarissa in her mind. Her love for fashion only grew throughout the years. In high school, she was voted most individualistic and most creative by her peers. "Early on, I had a lot of clarity about the type of person I was," Starnes says. "My two favorite subjects were history and fashion. So I asked myself what I would be happiest doing everyday — working in research or fashion? I chose fashion." Cloak & Dagger is both elegant and polished. Its vintage-inspired lines include stylish separates decorated with pleats and ruffles, as well as must-have basics for fashion-savvy women. Starnes works primarily with a neutral color palette, allowing her clothing to flexibly accommodate the range of a woman’s wardrobe. Her vintage-inspired designs can best be described as a quirky marriage between maritime wear and preppy British rugby. One such outfit illustrates the boutique’s unique sensibility: a crisp, pleated navy wool coat embellished with shiny gold nautical buttons and lined with a contrasting pattern. Such delightfully surprising details are typical of Cloak & Dagger. Under the coat is a chiffon dress with a frilly ruffle peeking out playfully from the hem. An impressive collection of other designers’ accessories complement and accentuate Starnes’ style. They include: New Zealand designer Karen Walker’s offering of vogue glasses; durable Fogal of Switzerland leg wear; and designer-label vintage items, such as Salvatore Ferragamo boots, Yves Saint Laurent shoes and Marino Orlandi handbags. Cloak & Dagger's own exclusive line of Italian leather totes are offered in basic and neutral colors, such as black and camel. The boutique also carries adorable little items, such as pocket-sized notebooks, Love Quote bottles containing precious message slips, home fragrances and locally handmade soaps. Having styled numerous high-profile clients in the past, Starnes can instantly visualize what will look good on loyal clients and new customers alike. Starnes liberates women's wardrobes with her chic and comfortable clothing in unmatched silhouettes and fabrics. If price is a factor, be sure to take note of Starnes's latest bridge line, C&D by Cloak & Dagger. This line is just as beautifully cut and well-made as Starnes' high-end signature Classic Cloak & Dagger line but is slightly more budget-friendly. The origin of the boutique’s name is fascinating: the Cloak & Dagger name is derived from Jack the Ripper’s murderous reign in the late 19th century, when ladies-of-the-night would be forced to conceal daggers beneath their cloaks for protection. Inspiration from this time period is evident in Starnes’ irresistible collection of tailored cuts and draped lines made from crisp wools and soft, embroidered chiffons. Any piece from Cloak & Dagger is bound to become an essential wardrobe staple and uniquely identify one’s style. For Starnes, fashion is a tool that empowers women. Her high energy and drive has kept her committed to communicating this belief in her designs all these years. She plans to open an additional boutique at some point, although the exact location is yet to be determined. 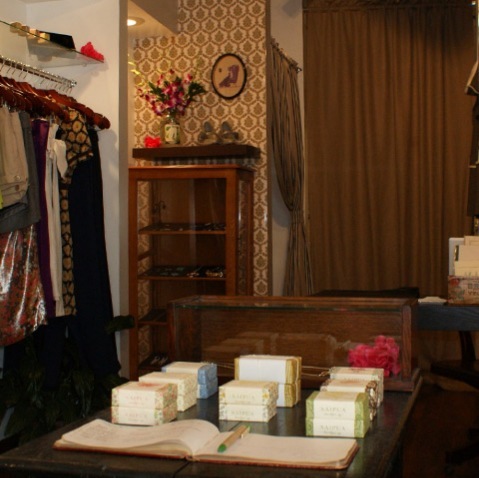 For now, you can drop by for a taste of playful, chic fashion at her boutique in the East Village.